By all accounts, John Tory will be declared the re-elected mayor of Toronto not long after the polls close Monday night. So, with the usual suspense missing from an already disjointed and disrupted campaign, what’s there to ponder and anticipate and analyze? For one, the fate of city council. There will be 25 instead of 44 councillors. Stalwart civic leaders, forced to battle each other for seats on the smaller council, will be defeated and prematurely put to pasture. The upheaval could see a shift in the balance of power, depending on who is elected in the suburbs. There will be a city council, yes, but will it behave the way Torontonians have come to expect? By “balance of power,” we mean the power to think about the city as a dynamic experiment in shared living, in a tight space with diverse lifestyles and vision; the balancing of the clashing ideals; the desire to build on Toronto’s ethos of civility and tolerance while driving it to succeed in a competitive world that’s led by dynamic cities. The 25 city councillors you send to serve as a check and balance against the mayor will determine the city’s immediate future. Those with short memories will have already forgotten that it was city council that held Toronto together during the hapless, hilariously unfunny reign of Rob Ford as mayor. Council had to strip him of his powers after he admitted that he was a mess for too many days and unable to function. Four years after that global laugh-in, the need for strong, sensible, progressive councillors is as great as ever, if not more acute. If you care about the city, you’ll be watching the ward races even more intently than in previous elections. With 44 councillors, the body politic is not adversely affected by one or two “idiot councillors,” a gadfly here, an outlier there. In fact, such off-the-grid, sand-in-the-eye input can be a worthwhile reality check. But the smaller the council, the more critical each seat and each vote becomes. As such, with just 25 representatives to be elected for 2.6 million people, the outcome of two or three tightly contested ward races could tilt the civic scale decidedly towards or away from the ideal. That, some speculate, is one of the reasons for Premier Doug Ford’s dangerous and vindictive act. In the speculation over why Ford gutted council by reducing the number of councillors, one recurring theme was the desire to shift power to the suburbs by giving conservative voices a greater percentage of the vote and influence at city hall. If that was the only reason Ford would not have bothered. The bigger reason was targeting 14 downtown wards to get rid of at least seven left-wing councillors who opposed his brother during his tumultuous four years as mayor. 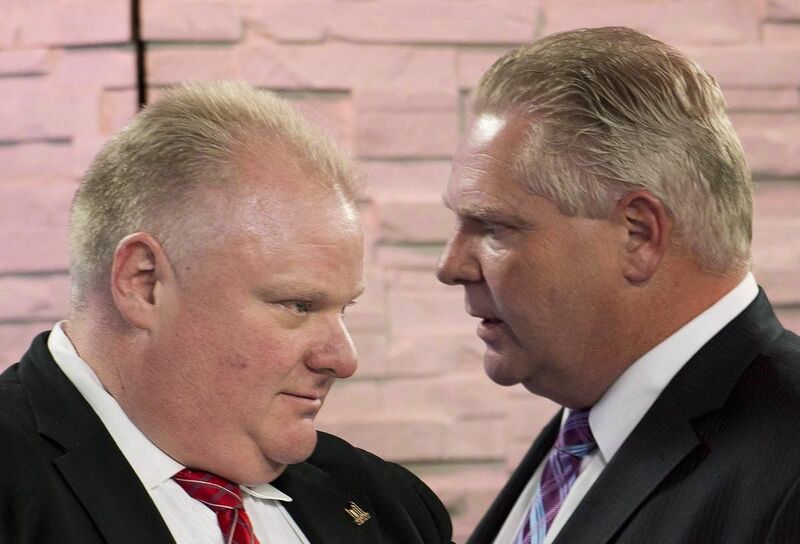 Ford will succeed in sticking it to seven lefties, no matter who wins. For example, Paula Fletcher is up against Mary Fragedakis in Ward 14; Josh Matlow and Joe Mihevc are locked in Ward 12 combat. Sarah Doucette retired rather than duke it out with Gord Perks. In each of those contests, the presumptive winner has a voting history almost identical to the eventual loser. Ditto for battles involving conservatives John Campbell and Stephen Holyday in Ward 2, Frances Nunziata and Frank DiGiorgio in Ward 5 and a Ward 1 match between staunch Ford ally Vincent Crisanti and the premier’s nephew, Michael Ford. If there is to be a shift, it would occur in six key wards — 6, 7, 8, 16, 19 and 23 — where strong right-wingers are arrayed against progressive-minded candidates. If veteran NDPer Maria Augimeri can hold off James Pasternak in Ward 6 York Centre; if the notoriously outrageous Giorgio Mammoliti goes down in Ward 7 Humber River-Black Creek; if Mike Colle returns to scuttle Christin Carmichael Greb in Ward 8 Eglinton-Lawrence; if Liberal David Caplan knocks off Denzil Minnan-Wong in Ward 16 Don Valley East; if Tory-backed Brad Bradford doesn’t take Ward 19 Beaches-East York; and a progressive like Felicia Samuel wins Ward 23 Scarborough-North, the new city council would be as progressive as any in recent memory. That would be a stinging rebuke of Ford and his vengeful act. And if Lekan Olawoye could pull off a monumental upset of both Frank DiGiorgio and Frances Nunziata, conservatives would be routed, not bolstered as Ford schemed. If all those wards go conservative, Ford will win three ways: he will have reduced the size of government, destroyed as many as 10 of his political enemies, and tilted city council to the right, paving the way for less opposition to his future assaults on the city. That should keep us interested Monday night as the results roll in.